The design for Wild Bill’s comprises two hangs, flown left and right above the 50-foot by 20-foot stage, each configured with a combination of six Bose RoomMatch modules that individually offer coverage patterns ranging from 55 to 120 degrees horizontally and five to 20 degrees vertically. 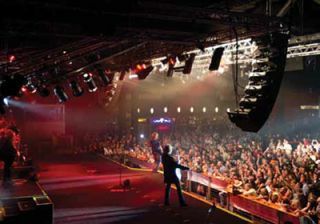 Georgia-born country music artist Bill Gentry had already built a significant underground following in the Southeast for his high-energy live shows when he opened Wild Bill’s, a dance club and concert hall located within a 72,000-square-foot former big-box retail store in the northeast corner of the Atlanta metro area in 2003. Having celebrated a decade in business earlier this year and played host to the likes of Brad Paisley, Keith Urban, Toby Keith, Brooks & Dunn, Rascal Flatts, Miranda Lambert, Trace Adkins, and—sometimes several times a week— Gentry himself, the 5,000-capacity venue recently underwent a significant upgrade to its house PA with the installation of a Bose RoomMatch Progressive Directivity Array system. According to Dan Korn, head of production for the venue and a “road dog” for the past couple of decades, including 14 years at the 40 Watt club in Athens, GA, and seven years touring with Athens-based band Of Montreal, Wild Bill’s was due for an upgrade. “Our old system was definitely antiquated. It was also set up completely improperly,” he said. Fortuitously, a former colleague at the club was familiar with Bose Professional Systems Division and its RoomMatch array module loudspeakers and suggested the club consider the system. The design for Wild Bill’s comprises two hangs, flown left and right above the 50-foot by 20-foot stage, each configured with a combination of six Bose RoomMatch modules that individually offer coverage patterns ranging from 55 to 120 degrees horizontally and five to 20 degrees vertically. The result meets the venue’s requirements for both maximum SPL and a well-defined coverage pattern. “One of my requirements was that I needed a house system that could do 120 dB, C-weighted, at front of house. It’s what touring engineers ask for. Without subs I can do 116 dB at front of house, undistorted. When you put subs in the system you hit 120 dB, no problem. So I’m happy,” said Korn.